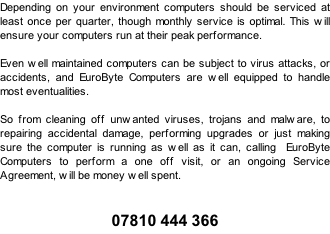 You can contact Eurobyte Computers 24/7/365. We will give you an honest appraisal of the problem, and your options. If you’d be better off using someone else, we’ll tell you! 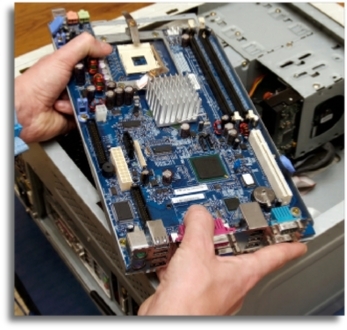 We will come to you, so there’s no travelling or disassembly required by you. We’ll quote you a fixed fee, no dangerous hourly rates to blow your budget, we’ll give you a time scale, and reliable after care support, free of charge by telephone. If we don’t fix the problem, you don’t pay. We can even organise a loan machine if the repair is too long.